An extensive sampling effort in bromeliad aquatic fauna in Brazilian subtropical area of the Atlantic rainforest, revealed a new water mite genus and a new species in the Atlantic rainforests in São Paulo, Brazil. This research is published in the open-access journal ZooKeys. The scientist chose to name the new genus Bromeliacarus after its host and the Latin word for 'mite' ('acarus'). The new species, B. cardoso, is called after its collection point, the State Park of Ilha do Cardoso, São Paulo, Brazil. The rosette (circular) formation of some bromeliad species traps water and organic matter from the canopy in leaf axils (bromeliad 'tank') and harbors many invertebrate animals species. Bromeliads phytotelmata are considered as biodiversity amplifiers in the environments where they occur due to the high number of species in this habitat which prefer it. "A diverse aquatic arthropod fauna is associated with bromeliad tank, composed mainly of aquatic insect larvae of several groups such as dipterans, beetles and damselflies, but also small non-insect invertebrates, such as ostracods, oligochaetes and mites," the lead author Vladimir Pešić from the Department of Biology, University of Montenegro explained. "The new species appear to live only in the water-filled leaf axils of the bromeliads where they walk attached to submerged detritus in bromeliads tank or free swimming in water column". 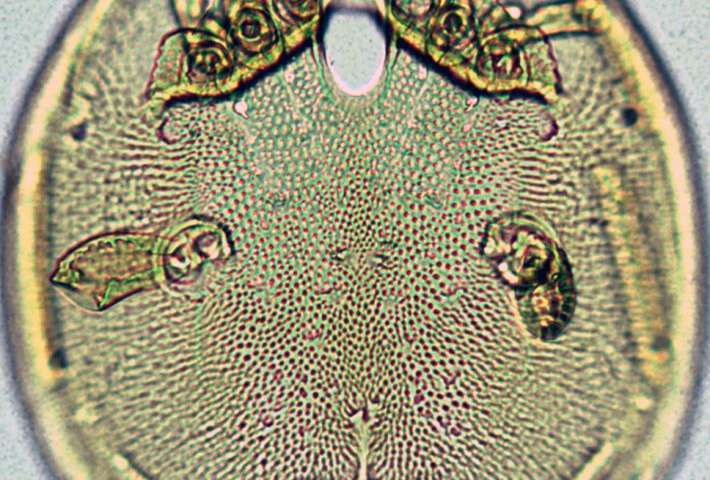 "In these bromeliad aquatic microcosms water mites, such as the new genus Bromeliacarus, are top predators," he concluded.